The BEAT receives necessary financing to push the project forward! The BEAT, the 16.6 acre site of the former Boston Globe’s headquarters, has secured $252,747,880 in financing via Oaktree Capital. The project located at 135 Morrissey Boulevard is transforming the existing three-story office building into a multi-tenant innovation park. According to BLDUP.com, The BEAT will include 360,000 square feet of office space and 300,000 square feet of flex/light industrial space, along with retail including a 10,000-square-foot fitness center, a 100-seat restaurant and a micro craft brewery with a food component, including an outdoor beer garden. There will be 868 parking spaces and over 200 bike storage spaces. 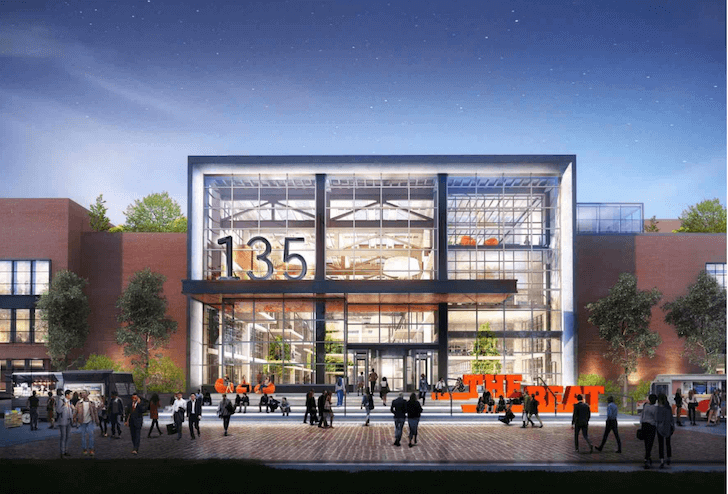 Additionally, a new multi-story atrium will be constructed at The BEAT’s entrance, creating a central gathering area with a food hall and collaborative meeting/gathering spaces. The atrium will be open to the public during working hours. Boy oh boy, is Dot changing! Lots of new development coming to this neighborhood! Fingers crossed that improvements to Kosciuszko Circle are in the works! We Got The BEAT – 135 Morrissey Blvd.